YesYesNo is a new interactive collective that specializes in the creation of engaging, magical installations that combine creativity, artistic vision and cutting edge R&D. 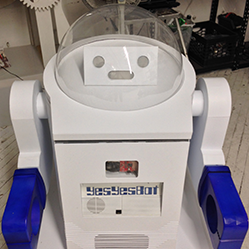 YesYesNo aims to develop work that puts creativity and awe at the forefront of interactive media. Molmol Kuo documents stories with new media, moving images, robotics, kinetics and interactive sculptures. Currently, she is making projects with sensors and electronics, focusing on building sculptures and interactive objects that tell stories -- or give good stories to tell.